Antwood - Sponsored Content. Vinyl LP, CD. Bleep. 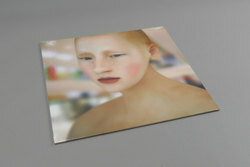 Planet Mu's in-house futurist Antwood turns to ASMR (Auto Sensory Meridian Response) to claw together influences for the second volume of grimeXtechno hyper-real hybrid structures that make up Sponsored Content. Moving in the same fields of thought as 0PN, Maxwell Sterling and Kuedo, Antwood forges an ecosystem of sub human synths and zero-gravity grime that makes countless inroads into future exploration. While it moves at the same sort of lightning speed that made the first wave of Wipeout videogames such a vivid glimpse of what was possible with the endlessly evolving technology, there is a certain sadness at the core of Sponsored Content, as if the endless stream of data and information of the high-speed internet age is forging more isolation than improvement. This delicate sadness is key to the success of Antwood's strange cyborg pop. A compelling yet moving vision of a world we may not have realized how far into which we have become.